Déménagement en provenance/direction de Huffman TX 77336? Obtenez GRATUITEMENT des estimations de tarif pour la location de camion au Lake Houston Tire. Les camions de location U-Haul sont spécifiquement conçus pour déménager des familles et non pour transporter des marchandises. Nos camions de déménagement possèdent plus de particularités de sécurité que tous les autres camions de déménagement de l'industrie, incluant une suspension pour un roulement en douceur et des rétroviseurs offrant une grande visibilité afin d'aider le conducteur. Que vous déménagiez d'un petit appartement ou d'une grande maison, le service de location de camions U-Haul à Huffman, TX vous offrira la location de camion de déménagement dont vous avez besoin pour vous rendre du point A au point B. Trouvez le camion de déménagement de la taille parfaite pour vous aider à déménager chez U-Haul, qui offre la location de camion à 19,95 $! 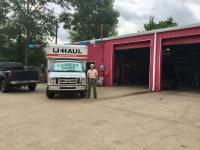 Les fourgonnettes et camionnettes de location U-Haul de Huffman, TX sont idéales pour les projets d'amélioration domiciliaire, les livraisons et d'autres petits chargements. Louez une fourgonnette ou une camionnette pour économiser lors d'un déménagement ou de livraisons de courte distance. La location de fourgonnettes et de camionnettes est très populaire auprès des entreprises locales et des étudiants, comme pour les petits déménagements résidentiels à Huffman TX 77336. Nos fourgonnettes de déménagement en location sont équipées de la climatisation, de barres de protection pour protéger vos biens et d'une attache pour remorque de location. U-Haul offre des fourgonnettes de location à 19,95 $ à Huffman, TX; réservez une fourgonnette pour votre déménagement chez Lake Houston Tire! Convenient location, but very difficult to get a moving truck and /or vehicle in and out of. Had to wait an hour for an employee to get owner/manager to inspect and process the Uhaul that was returned, before we could leave. Even approached employee to let him know we were there to check in Uhaul. Nothing. Rick Diaz, was very helpful. I would recommend this U-Hall dealer to anyone looking to rent a U-Hall. Rick, is very knowledgeable and answered all my questions. The guy wasn't there when we arrived at our scheduled time to pick up the trailer. We received multiple messages to be there at a particular time to pick up, was frustrated the person who would be handling things wasn't there. Disappointed that I had to go to three locations that were near where I needed to rent from. Finally ended up with something way larger than I needed, but the rep at this location was very professional, courteous. Contract terms were not clear because I returned the truck earlier than expected and charges have not been adjusted. I would offer the customer to let them use their own insurance instead of charging them for the uhaul insurance they wouldn’t use! Was not very clear on that. None of the contract was explained. Cost me an extra $330. Will never use U-Haul again. The pickup location owner was amazing. We had not scheduled to pick up at this location but were bumped to it the day before. So it was not as convenient a location as our reserved pickup location. And the scheduled pickup tine was after the tire shop would normally have been closed. There was no phone number listed on the changed reservation for us to verify anything. He was there and was able to help us get our trailer. Luckily, we were at a tire shop because thr trailer had bald tires and was unsafe for travel. He had to call and get permission to change the tiresbprior to us taking the trailer. Huge inconvenience of time for us. We appreciate thw time he spent to make the trailer safe for us. But a clustwr of thinga went terribly wrong with this trailer pickup, extra travel to location, pickup time after normal business hours, unsafe vehicle with bald tires that had to be replaced. All of this cost us A LOT of extra time. I was very happy with the service at Lake Houston Tire. They were polite and helpful. The truck was clean and ready to go. I need to rent a truck next week and I will be going back to the guys at LHT. My reservation was supposed to include appliance dolly, regular dolly, a couple 4 wheel furniture dollies, and two dozen moving blankets. The facility had no items. The owner attempted to contact a few other locations to locate for me, but could not locate items. He attempted to contact Michael Merriman (regional manager) and left voice mails a couple times, but received no response. I attempted to contact as well. I ended up having to drive the truck all around to various locations attempting to locate dollies and blankets, all the while I had 4 movers at my house billing me $140hr waiting to load. Very disappointed in the process. I reserved online, and even performed check in process on line to assure no issues. Reserved a truck and auto transport, a week I'm advance and had to travel to two separate locations about 5 miles apart. First of all, I was in the New Caney Texas location when The trailer I was going to rent was rented out from underneath me while sitting there for two hours on the phone with uhaul about their prices. The web site says 29.95 and then the total was 340.00 for a one-way. Then U-Haul charged 4 days 680 miles and my trip took me two days 560 miles and I could not get reimbursed for the other two days although I was told I could by the dealer in Huffman. Then U-Haul charged 4 days 680 miles and my trip took me two days 560 miles and I could not get reimbursed for the other two days although I was told I could buy the dealer in Huffman! I called uhaul and I asked for the recorded copy of my conversation, I was transferred 7 times. (How can you charge a trailer milage with no way of knowing how many miles it took? I will be contacting the BBB!!! We were the first customers at this location. The guy helping us was great. Location is easy to get to... I pucked it up here and dropped it off the next day in Spring. Great experience and would definitely use them again! Thanks!